Writing, sailing, teaching - a little of each. I've created a new author webpage in advance of the publication of Blood Clay - now rescheduled to early 2011 - and will be blogging at that location. If you've stopped by Worldwright now and again, thank you. I hope you will visit at the new "house" or see me on Facebook. We've been a nation of road-builders, to the point that the asphalt and concrete have overwhelmed our cities - cutting off neighborhoods, fostering big box development, abetting the sprawl into the surrounding countryside. And there's little romantic about dirt roads to those who have to use them. One of the great rallying cries after World War I was that we needed to "get our boys out of the mud" with farm-to-market roads. Early in the 20th century, North Carolina earned the label "the Good Roads State" after the General Assembly approved a $40 million highway bond to pave roads connecting the 100 county seats. So there is something painful about watching this particular regression, as highway crews chew up the pavement they once laid down because it's just too expensive to maintain. We may have too many roads and too many ill-considered roads, but those who live past the end of the pavement know the cost of not having it. While I live on a paved street in the city these days, I spent most of my life on one of those "other" types - from tar-and-chip to gravel to plain dirt with a strip of grass down the center. The memories are specific: The first, gravel in my knees from falls taken from a road cruiser bicycle not designed for loose surfaces. Poor road maintenance in the winter because the plows would tear up the thin layer of tar. The smell of asphalt sprayed from the back of a truck. The slew and slither of braking on gravel. Dust that coats the cars, the houses, the wash hanging on the lines. Potholes filled with water. Gravel roads gullied and dirt roads turned to mud in stormy weather. The knowledge that the fire truck or ambulance would come a few seconds or few minutes slower than it might "on the hard road." I had a spell of road-building, when I homesteaded a farm in West Virginia. There was a dirt path to the back side of the farm and a gate onto the hayfield where we built. The dirt lane - actually a state road, abandoned - soon wallowed out under daily use, and we spent the first winter excavating rocks and filling the holes so we could get the pickup truck in and out. That's when I became suddenly and horribly allergic to poison ivy that was rooted among those rocks. It was wet, cold, heavy work - better then than in high summer, but no easy task even for sturdy 20-somethings. It was easy to see why road-building had for so many centuries been delegated to soldiers, serfs, slaves, and convicts. It may be practical to let some less-traveled roads revert, but it has emotional resonance like a padlock on the factory door - something's gone, and it may not be coming back. I just finished recovering the scattered chapters of Survivors, my novel of hard times in the early 70s, for ebook publication on Amazon. I had a file on my computer that purported to be the "complete" mss, but as I went through tweaking and editing, I found several sections mysteriously missing. One I could account for - a chapter that I had excerpted for a newspaper publication - though why I deleted it rather than copying is beyond me. The other lacunae are just inexplicable. I had to find old 3.25 "floppy" discs in the closet to locate the missing chapters. Lucky that I still had them. Not so lucky with Neena Gathering, which was written on a Kaypro using 5-inch really floppy discs. So the entire thing is ready to upload. Maybe later today. Found this nifty little wiki - if you're partial to apocalypse, take a look at this growing list of ways the world will end. Disclaimer: my own pastoral post-apocalypse appears here, Neena Gathering, published under my previous moniker of Valerie Nieman Colander. The wiki is the work of a blogger and joins the various listings of The End of Things. Since this is a wiki, you can play, too. I know the names of only one or two. Each plant has a story - this is the one about the ditch lilies. A few years ago, I was taking a shortcut to Battleground Avenue and passes a neat little cottage with a flower-filled yard. By the street was a sign - Ditch Lilies, Free. I stopped and chatted with the owner. She'd been overrun with them and was offering them free "for the digging." This was in September, their flowering done. So I dug a basketful and planted them on Elam Avenue. I moved them a couple of times, along with the rest, and kept watching for blooms. Never happened. What could be wrong? Ditch lilies are the toughest of creatures. A fellow GSO gardener had this to say. 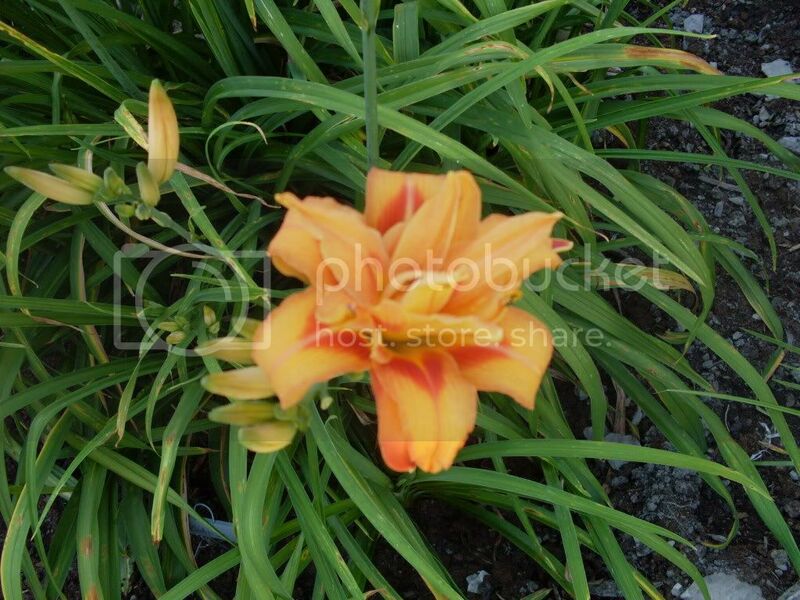 The ditch lily I was thinking of, Hemerocallis fulva, was a strong grower, long stems, and single orange blooms. It's sister to the more elegant lemon lily, Hemerocallis flava, and when then grow together, tends to overwhelm it. The ditch lilies I dug that day, and have moved, have indeed bloomed. They are double, with red flashings at the base of the petals. They are called Kwanso, I think. I know this because I passed along clumps of ditch lilies to a neighbor. Those bloomed famously this year, and I spotted the same flowers here and there among my beds. I am a writer today, perhaps because of red shoes and Little Golden Books, but mostly because of the story about the accompanying story. I used to hear, as well, about his prize-winning school essay on teaching the calf to drink. At some time when I was in my late teens and gained a manual typewriter, I retyped the original. My father was a better typist, still is, but I made a fair copy that went into a three-hole binder. I asked my mother to find the essay and she sent it – the paper turned the color of brown eggs, the red-penciled “A” still clear at the top of the first page – along with my forgotten typed copy. My father was born in 1931 in the farming region of western New York, worked hard as a child for his own family and others, plowing and planting, milking cows and putting up hay. As a teenager, he dreamed of being a baseball player, walking miles to and from sports practice at the school in Little Valley. His graduating class was tiny, college an option for only a couple of them. When drafted during the Korean War (I cannot call it a “conflict”), he volunteered for the Marines. After being wounded, captured, and held as a prisoner of war, he returned to home ground on the Allegheny Plateau. After a few years, he started a family. That was me. I know that times were tough. My father suffered both the aftereffects of war and the paranoia that pegged returning POWs as possible saboteurs, victims of Communist brainwashing. He got a job in a factory and worked his way from sweeper to machinist to, eventually, foreman – blocked from further rising by the lack of a college degree. He never wrote another essay, until in recent years he put down a brief account of his military service. It’s the way of things that memories shift. I truly remember nothing of early childhood, but I am told that I loved red shoes. And books. I grew up with enough of both. Most of all, I had a story about the following story that would someday lead me toward my own writing. Our little farm nestled back in the hills always had a little excitement and a touch of humor when a newborn calf received its first lesson in drinking. While Dad wrestled with the calf to place its head in the pail, the rest of the family would gather around for a good laugh or two. Once, while shaking with laughter at his futile struggles, Dad handed me the pail and commanded me to teach the calf how to drink. I then realized Dad’s viewpoint in stating that the whole affair was entirely lacking in amusement. I picked up the pail of milk gingerly and carefully stalked towards the frisky fellow. We circled each other for a couple of minutes, each waiting for the other to make the first move. Tiring of this procedure, I set the pail down and make a flying tackle for the calf only to find myself in a peculiar position on the floor. I arose with anxiety as to whether I had any fractures but after careful inspection I found none. Meanwhile, the calf had discovered a fly on the wall, and was deeply engrossed in its proceedings. The next incident brought gales of laughter from the onlookers, who had now gathered around the stall. I had managed to corner the critter and started to force its head into the bucket, when a new idea suddenly popped into his head and he made a quick bolt to gain his freedom. The surprise charge was successful and he was once more dashing around the pen. It was then I decided to tie the calf to the wall so he couldn’t get away. I acquired a piece of rope, and was again chasing the stubborn creature into a corner where I could tie him. I finally caught him and slipped the rope around his neck. Now came the fun. Finding he could not release himself, he planted his legs and refused to be led to the ring on the opposite wall. I tugged and pulled to no avail. With a quick jerk, I managed to move him and pull him to the farther wall and knot the rope in the ring attached to the side of the building. Now, I thought, I would get somewhere. But my thoughts and his didn’t coincide. I picked up the pail and approached the calf with a gleam in my eye. After a few attempts to place his head in the pail, with no cooperation whatsoever from the calf, I gave up that idea and tried a new method of teaching. First I put my fingers into the milk, which was cold by now, and inserted them in his mouth. He licked the milk off from my fingers and then began to chew on them. With a yelp, I hastily removed my hand and gazed at the indentations on the fingers. But this trivial matter did not phase me and I started the tedious process all over again. A few bitten fingers later, the calf had tamed down and began to lick the milk from my fingers in earnest. Soon I started to ease his head down into the pail and succeeded in getting his nose into the milk. This was something different than before and he jerked his head from the bucket. I again lowered his head down and he was soon drinking the milk. With a boastful smile of success and satisfaction, I raised my face and looked at the spectators. Then it happened! Evidently the calf had drunk all the milk he was going to because he unexpectedly raised his nose from the milk. His head caught the handle of the pail from my hand sending milk all over me and the wall. I wiped the milk from my eyes and profile, with the back of my hand, and used a language not found in any dictionary. After the howls of laughter had subsided, Dad informed me that the calf had been taught enough for one day. I released the wild animal, and stepped out of the pen with the empty pail. Maybe the calf learned something from this lesson, but personally, I think that I learned more than he did. I spent a good part of the day cleaning rust off some valued tools. This morning, I reviewed early chapters and started writing again on "the marina novel" that has been slowly gestating while I worked on old novels and new poems and on life in general. The narrator's voice came back readily, though I'd been astray in revisions on Blood,Clay and retyping parts of Survivors to put up as an e-book. Sometimes, if it hasn't set too deeply, rust can be removed. This afternoon, I used Liquid Wrench and steel wool and Q-tips to clean away corrosion on some of Jack's tools, caused when a violent storm forced water into the cabin of our sailboat. He particularly treasures a small pair of snips that he used while working on RC cars with his son. When he held them up and showed their arthritic action, I know he felt they were beyond saving. But rust, if it hasn't set too long, can be removed. My third novel, Blood Clay, will appear in November from Press 53. It is set in Piedmont North Carolina, my home since 1997. Other books: Wake Wake Wake, a poetry collection; Fidelities, a short story collection; a novel about the 1970s called Survivor; and an SF novel way back when, Neena Gathering, in Brazil published as Mundo Perdido. I teach at North Carolina A and T State University after a long career as a newspaper reporter and editor. And late in life I have taken up sailing - look for High Cotton on Lake Kerr. All original material on this site is Copyright, Valerie Nieman.